The Ridley-Tree Cancer Center, this year’s President’s Award honoree, opened in September 2017 bringing medical oncology, radiation oncology, surgical oncology, clinical research, and oncology supportive care teams together under one beautiful roof. The adjacent half-acre Healing Garden provides a serene area surrounded by shaded walking paths and benches for patients, families, caregivers, and staff. 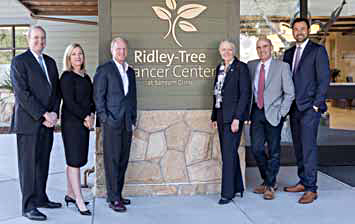 The oncology operations are now called the Ridley-Tree Cancer Center, in tribute to Lady Leslie Ridley-Tree, who puts her resources to work to make Santa Barbara a community where every life can be enriched and lived well. 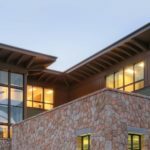 The Ridley-Tree Cancer Center works closely with their fundraising partner, the Cancer Foundation of Santa Barbara, to ensure the Center serves as a regional destination for oncology services that ranks with the best major treatment centers, delivering exceptional cancer care to every patient, close to home. The aim is to keep the Central Coast at the forefront of modern cancer care through the recruitment and education of highly trained medical staff, acquisition of new technology, active participation in clinical research, integration of oncology services, and continual introduction of promising new methods of treatment. It took a team including Cearnal Collective LLP, G.L. Bruno Associates, and countless others to make this dream a reality. Gary Bruno, G.L. Bruno Associates, Inc.